The Nauticans for Warhammer Fantasy Battle: The Nauticans make landfall ! The Nauticans make landfall ! I figured it was time to let the cat out of the bag - I was all at sea for a few weeks waiting for the Nauticans to navigate the Oceans to Britannia. I couldn't fathom where they had drifted to but shiver my timbers everything is now ship shape and Bristol fashion ! What I'm trying to say is... all of the Nautican Army miniatures that I ordered have finally arrived. One parcel went missing but the supplier (armorcast.com) was extremely cool about it and dispatched the miniatures again free of charge. Both of the others (from hydraminiatures.com and taban-miniatures.com) got held up by customs in the UK but did finally make it to my door - hurray ! 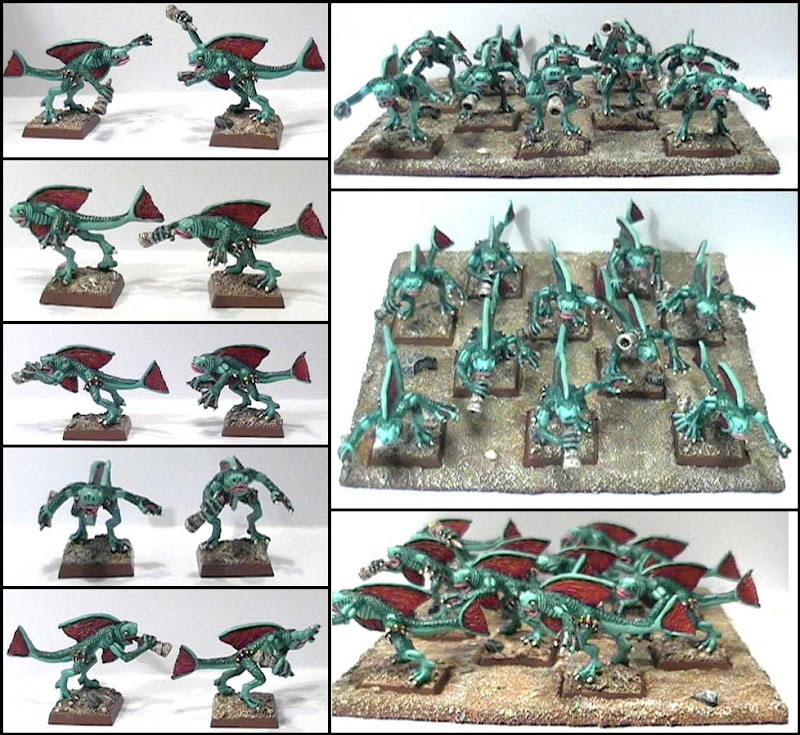 I have Lizardmen Saurus for the Trident Guard and Interceptors and Skinks for the Coral Hunters and Crest Riders (not ideal but they'll do for now). * I only ordered a few because I wanted to see what they looked like up close. I like them, so I'll be getting some more. I'm preparing for a Nautican vs Skaven battle next week so I'll be sticking the slippery fellas together and will get some unpainted miniature pics online soon. We've weighed anchor and my fishy plans have finally set sail. The Skaven will be the next Warhammer race to walk the plank ! Image is copyright Troll Fordged. Used without permission, all rights reserved. You should post a picture of the entire army.